I was awarded the 'E' for excellent award by the gorgeous Cath and Lauren of Asian Cajuns a little while ago and have finally got round to posting the award-cheers, gals!! The lovely duo are currently into the fringe trend and I commented on that post how I adore this trend and I would work it if I get a fringey item-well, I had totally forgotton about the fringey earrings hubby bought for me a few months ago! I'll be wearing these over Christmas!! The lovely 'Odd Girl Diaries' also awarded me an 'I love your blog' award-thanks so much to all the gals for both of them, much appreciated! 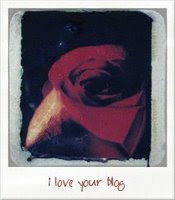 I would like to pass these on to all my bloglist-I love you all and think you're all Excellent-so there you go!! Congrats! I love your new earrings to! Take a look at the jewelry launch I was at yesterday, so many beautiful things! Hi Silje-thanks so much my dear, I've just checked your lovely post, some great pieces!! way to go, Sharon! those earrings really are stunning, btw...great idea to wear them during the holidays. Hi emily-thanks so much my dear! I adore your earrings. Nice jewellery! Those earrings are fantastic! Congrats on the awards -- you deserve them! thanks so much for reading..love your award..you deserve it. Lovr those earrings! And congrats on the awards. What a nice gift from hubby. 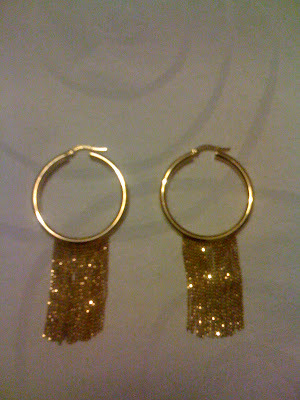 I love fringe as well - the earrings are gorgoeus! Hi Janet taylor-thanks so much my dear!! Hi couturecarrie-thanks for your lovely comment! Hi tara-always so lovely, thanks!! Hi ellie-keep up the good work my dear! Hi Em-thanks for such a lovely comment! Hi the paper doll-thanks so much my dear! Hi lenya-thanks very much my dear! Hi deb-always so kind and lovely, thanks!! Hi wendy-thanks so very much my dear! Hi tina-thanks for stopping by my dear!! Well done on the awards, I off to see if I can make fringe jewellery. darling hope you had a good wknd?congrats on the award,your blog is stellar.cant wait to see those lovely earrings on you! congrats on your award! and those earrings are truly glamorous, can't wait to see them in a vintage inspired outfit! Congratulations darling, you so deserve the award!!! And OMG I love your earrings!!! Yes, fringes can be great. I bet you'll look gorgeous with then on Xmas. Hi a pot, a thought & a smidgen of dirt-good luck my dear and thanks!! Hi marian-thanks a lot, always so lovely!! Hi karima-thanks so much my dear!! Hi The Seeker-thanks so much for your lovely comment my dear!! Lovin the earring for sure. Your jewelry collection rocks! So Jealous! Hi budget chic-thanks for such a lovely comment! those earrings, Sharon, are amazing! I want a picture! Hi fashion herald-thanks my dear, I sure will get one soon!